To do: Add sources. A lot of them. There are some minor characters mentioned in the Pikmin franchise, but are never given any more importance to the plot than the main leaders and other similar characters. Some of these supporting characters include family members to the main cast. Because some of these are only briefly mentioned, little is known about them, such as their name. Olimar's known family consists of his wife, his son, his daughter, and his pet, Bulbie. Since Olimar works for Hocotate Freight, it seems he gets little time to spend with his family. In Pikmin 3, he addresses this by stating that he will take his whole family on a vacation when he gets home. Judging from the Pikmin 2 mail, it seems that Olimar's family has no responsibility for handling money, because they spend Olimar's bonuses on things like trips to the hot springs, and his son states that he should send in a bonus check for a spam mail offer. Olimar's wife is a woman who cares much about her kids, but irresponsible when it comes to money. When Olimar's special bonuses arrive at his house, she often uses the money to buy her kids what they have been wanting. However, it seems that money can make the best of her. Whenever the bonuses come in, she seems to get stricter on her kids, and might be lacking in common sense, as Olimar's son states that she wants things like sending Bulbie to the circus. It is stated that she goes to beaches and theaters all day until the kids come home. At one point, she tried to apply for a part-time job, but got rejected in favor of younger employees. After she wastes money buying lottery tickets, she realizes the mistake she made, and loosens back up into her former self. After time has passed, she pleads for Olimar to come home (very lovingly), promising his favorite meal – pikpik carrot soup. According to Olimar's log in Pikmin 3, he seems to trust her more than Louie. In Pikmin 2, her age becomes indirectly noted, given that Olimar mentions his wife's wrinkles – a sign of elderhood. He plans to take her on vacation to calm her down. At some point after collecting all 201 treasures in Pikmin 2, she will send a repeating message asking Olimar to come home. The only way to stop these messages is to open a new save file. 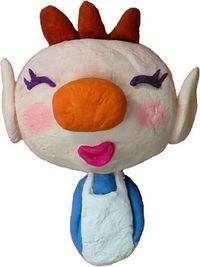 Olimar's wife, as seen in the mail of Pikmin 2. Olimar's wife in the mail of Pikmin 2, once the debt has been repaid. Olimar's son is a standard young boy. He seems to be fascinated by his father's adventures, and seems to envy him. He is addicted to video games, and enjoys them more than studying, in contrast to Olimar's daughter. Judging by some of his mail, he must be in his teenager years, and is anxious with girls. He always yearns for his father to come home, and doesn't like it when his mother becomes strict because of the pay bonuses, asking his father to come home to fix the mess. He seems to be easily won over, as he asks if he should send in Olimar's bonus check for a piece of spam mail. Olimar's son is also known to have gifted his father the Sagittarius. Because of this, some fans nickname the boy "Sagittarius". 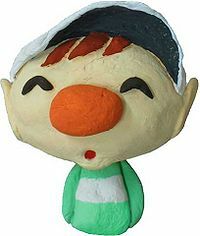 Olimar's son as he appears in the mail of Pikmin 2. Olimar's daughter is seen only wearing a pink suit with a hood of sorts, and has little personality. In her mail she sends in Pikmin 2, she discusses briefly how she is being pressured to become a proper lady, and asks Olimar what she should do. She also speaks about how Olimar's wife has changed during the absence of her husband. She attends some school on Hocotate, based on the fact that her mother gets strict about her writing and studying. She also appears to like jewelry, as noted by Olimar on some treasures. Olimar's daughter is known to have gifted the Libra to her father, and that the Libra is her astrological sign. Because of this, some fans give her the nickname "Libra". She also appears as a sticker in Super Smash Bros. Brawl. The sticker increases Pikmin attack damage by 7%. Olimar's daughter as seen in the mail in Pikmin 2. Olimar's family, as seen in his voyage log. Bulbie is at the bottom. 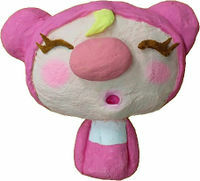 Bulbie is Olimar's family pet, which is an Hocotatian version of a dog. He is briefly mentioned in Pikmin and Hey! Pikmin, and is described to physically resemble a Bulborb, as the voyage log he's seen in depicts him with eye-stalks, a wide mouth, and two legs (although his front legs might just be hidden). He is also described as very lazy, which is sometimes a characteristic of real world dogs. While Olimar is away from his family in Pikmin 2, Bulbie gets thin after his family forgets to feed him. He later eats many pikpik carrots and returns to normal. Olimar's wife also threatens to send Bulbie away to the circus during this time. Olimar's mother and father are briefly mentioned in his notes on the Priceless Statue and Worthless Statue, respectively. Olimar sees his father as slightly worthless and, at a first glance being impressive, but being considered "cheap" upon closer inspection. Olimar's mother is reminisced by him when writing the notes for the Priceless Statue, and notes how the treasure is similar to a gift he once gave her for Mother's Day. Although he likes her, he admits there are times where he is not fond of her. Finally, the notes on the Taste Sensation also mention Olimar's mother, in that Olimar describes the treasure's taste to be similar to something his mother has cooked for him by hand. Three members of Louie's family are alluded to in Pikmin 2: his father, his aunt, and his grandmother. Only his grandmother speaks at all through mail, and none of them have nearly as much development as the members of Olimar's family. All of them, however, seem to be quite fond of bugs. Louie's grandmother shows a lot of love for Louie, as well as a lot of concern as he is missing for part of Pikmin 2. In her mail, she describes fond memories of Louie as a boy and how bugs loved him (or rather, loved biting him). She also talks about how she made Louie eat bugs and how he loves pikpik carrots, and she apparently sends preserved bug food with her mail, though it is never actually seen or detailed. After all the treasures in the game have been collected, Louie's grandmother sends one final message, in which she shows her pride in how Louie has become an "extraordinary man". Though it is never mentioned in-game that this character is his grandma, in the game's files, the icon for her mails have the file name luibaba, "baba" meaning grandmother, and "lui" referring to Louie. The age shown on her portrait further hints at the possibility of her being his grandmother. It appears as though she is not alone, given how at one point she uses the term "we" in one of her mails. Louie's aunt is only briefly mentioned by The President, who refers to her as Louie's "auntie". She is mentioned to have sent some cookies to The President, but no other notes are made of her. The President has only one known member in his family, his wife. The President's wife is quite a sassy woman. She reveals to constantly be yelling at her husband for loafing around. In her mail, she refers to herself as "the REAL boss" of Hocotate Freight, and sends the President mail stating that his report is wrong. She also reveals that the ship sends her a report at the end of every day, and says that the ship knows that she is the real boss. Currently, it cannot be confirmed if her claims about being the real boss are just insults and that she is not really the boss, or if she speaks the truth and is the actual leader. There is also the possibility that she is actually an equal-parts co-owner of the company, and claims the things she does due to working harder than her husband. During the President's absence, she begins turning the company around for the better. Once all the treasures are retrieved, she thanks her husband and says she sees him "in a new light". This implies that she is very responsible about work. An alternate photo for The President's wife, seen in Pikmin 2's mail, after all treasures are collected. Alph has only one known important member in his family: his grandfather, Drake. Alph talks about him sometimes while aboard the S.S. Drake. He also has many siblings. Very little is known about Drake. All that is known about him is that he designed the S.S. Drake and that he knows about some of Hocotate's history. Other than that, it is said that Alph spent a lot of time with his grandfather as a child. As a result, he looks up to Drake as a role model. The S.S. Drake's trophy in Super Smash Bros. for Wii U mentions that the name "Drake" may remind players of the second man to circumnavigate the globe, Sir Francis Drake. Because Drake's name begins with D, some fans believe that this would be the name of the fourth playable leader, had the developers not cut the character off during development. Alph also has twelve older brothers, one older sister, and one younger brother. Alph mentioned how his older sister used to always share food with him even when it was scarce. Other than that, Alph doesn't talk much about them. Brittany also has only one known member of her family – Auntie Bea. Auntie Bea is Brittany's aunt. She is known for her famous fruit pastries on Koppai. Auntie Bea's hair is similar to the color of the Dusk Pustules, and in Brittany's notes on the same fruit, she states that to be a "rebellious streak", implying most Koppaites don't have that color of hair naturally. Auntie Bea's nose is similar in shape to the Tremendous Sniffer, and she is the envy of the family because of her nose. She treated Brittany with lots of love, giving her sweets and such, and Brittany likes her because of it. None of Charlie's blood relatives are ever mentioned, but a pet is mentioned; in the US version it is a dog, while in the European version, it is a pet duck named Elizabeth. Alph also mentions that he's not sure if Charlie is married or not. In the US version, Brittany mentions that Charlie has a pet dog when she takes notes on the Dawn Pustules. Charlie apparently painted his dog to match his favorite color – the shade of green seen on his spacesuit. Unlike with Bulbie, this pet is directly stated to be a dog, so Koppai must have animal species similar to those of Earth, at least in theory. In the European version, there is no mention of a dog at all. Instead, in one "Talk" section where Alph asks Charlie who "Elizabeth" is, Charlie explains that Elizabeth is his pet duck with which he shares a strong bond with and that he considers her his soulmate. Again, this pet is directly stated to be a duck, so together with Charlie's rubber ducky and Brittany's mention of geese, Koppai must have animal species that closely resembles those of Earth. An example of a spam icon from the Pikmin 2 mail. There are five characters in Pikmin 2 that send spam e-mails after the debt has been repaid. The icons for these characters merely show a silhouette, leaving their appearances mostly unknown. They all attempt to advertise one thing or another, and include a real-world Internet address in their messages, for the players themselves to visit. The first spam message the player will receive is from a person who is apparently very lonely and wants a friend to listen to their troubles. Based on the shady outline, this character is probably female. The second spam message is from someone talking about saving tons of Pokos through bargains and cut-rate prices. Olimar's son also mentions that he received a similar message, and asks Olimar if he should send his bonus check. The third spam message is received after Louie has been recovered. The sender talks about some device that accordingly "slices... dices... plays videogames... sends mail... wraps gifts" and "cures snoring". The fourth spam message talks about changing jobs, and finding "the new you". It advertises an unseen company known as Hocotate Whiz. The fifth and final spam message is received after all the treasures have been collected. It advertises music. It speaks of "Pikpik's greatest hits", implying that there is a band on Hocotate by the name of Pikpik. This page was last edited on April 16, 2019, at 19:12.